Home Blog IP Networks Enterprise Networks How does a switch work? 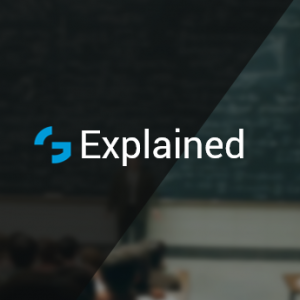 To explain how does a switch work, let me make an introduction to the subject by explaining background of TCP/IP stack layers, frame and the purpose of switch. This will help you to understand the exact operation of switch which is the main agenda here. To allow communication between billions of computer devices, intermediate network devices are needed. 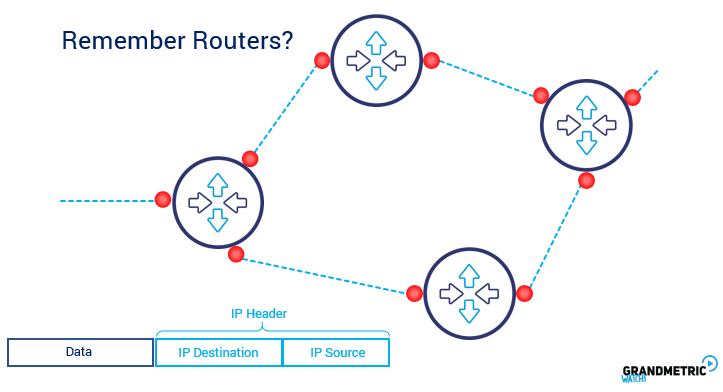 As we know from the How does Router work post, routers, like crossroads and road signs, properly direct packets from the source to the destination. They look into the IP packet header searching for the destination IP address (Source and destination IP are included in the packet header) and based on local routing table, route the packet to the next hop towards the destination. So routers operate at Layer 3 (IP Packet is network layer – Layer 3 communication structure). Frame is a portion of information that allows for packet to traverse particular medium from one device interface to another. Ethernet, as an example, describes many technical parameters of how devices can access the network, how cable connectors should look, what speeds the transmission can achieve and finally how the bits and addressing are organized. So layer 2 is strictly connected with type of medium or interface of device. Take a look at the TCP/IP communication model to localize the Layer 2 (Data Link Layer). The Layer 2 is where the switch operates (marked in red). Every IP device produces packets and they are forwarded across the network regardless of network access type. Every access type uses its own structure to forward the data in its environment. Ethernet uses structure called Ethernet Frame. Frame “surrounds” the packet as shown in below picture. 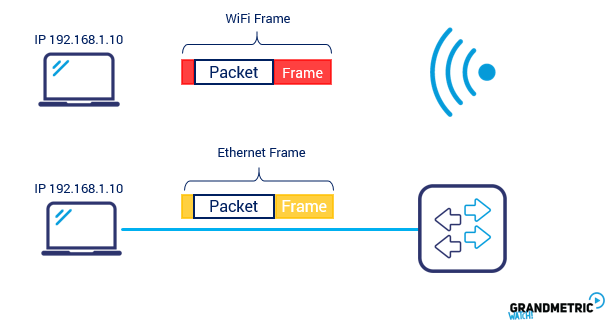 To transport IP packet through the Ethernet environment, Ethernet facing device adds extra bits to the front and back of the IP packet making the frame. This bit-adding proccess is called encapsulation. The frame header contains inter alia source and destination MAC addresses. The source MAC address is the physical address of the sending device, the destination MAC address is the Ethernet (physical interface) address of destination device within the same Ethernet segment. Remember that the frame is specific for ethernet segment that is why frame doesn’t last traversing many mediums and many separate ethernet segments. You can ask: If there is computer to computer direct Ethernet connection why I need the ethernet switch? Right, but what if you need to connect third device to the group of devices (ethernet segment)? Then you need a communication device with a particular logic. And this is what switch is intended for. Now, we need to have some devices that allow us to connect high amount of users and wired devices together. This is something that routers are not intended for. Because routers in most situations have limited number of ports, operate with more advanced features and they are more expensive. Let’s imagine that we need to connect small home network (4 laptops) with router to Internet Provider ! Not possible, not enough ports! Switch is the required medium for such requirement. Switches are considered the best network devices to wire connect high number of ethernet devices. So how does the switch work? If we have computers connected to our switch we can concentrate on how does switch really work. Every device has hardcoded physical address called MAC Address. 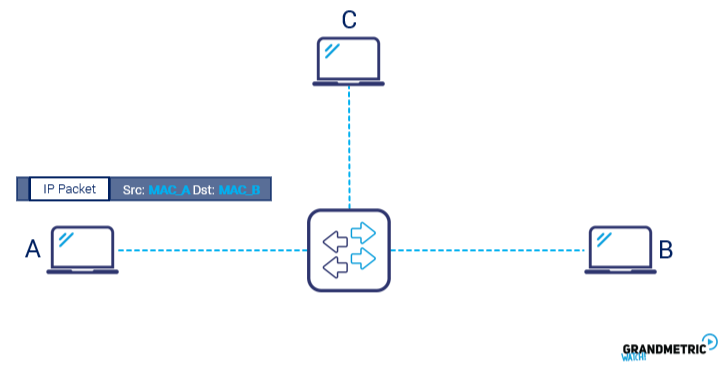 Again, if computer sends the IP packet to another device, it encapsulates the packet with frame using destination MAC address of device B and own MAC address as source and then sends it out. 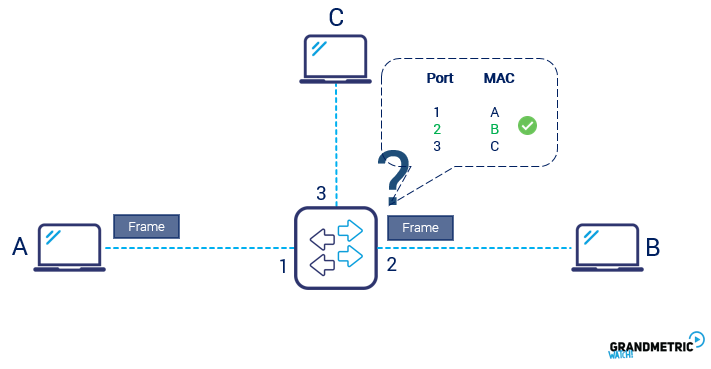 When frame arrives at device B, it is stripped and IP packet is received but before it gets there it traverses the ethernet switch/es. When a frame arrives to a switch, the switch needs to direct the frame out through the right port, this redirection is called switching. When a frame enters into the switchport, the switch checks the dynamic table in memory which stores Physical Port and MAC address pairs. Switch then knows which port to use to forward the frame. Remember: switch does not look into the IP packet and forwards frame as is based on destination MAC address. How does the switch build the table? 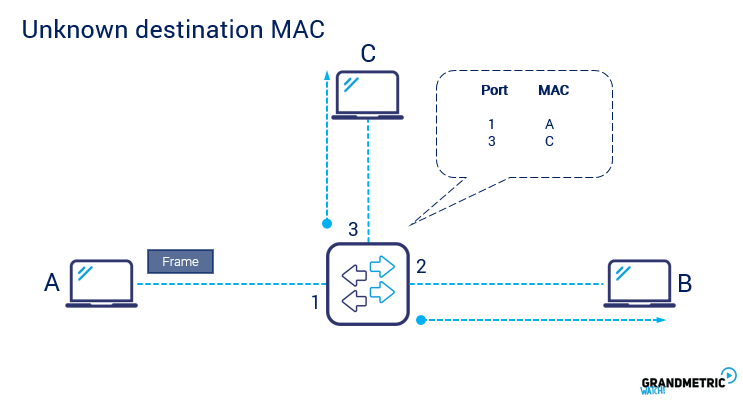 Switch learns the mac and port pairs in the process called MAC learning: When a frame first arrives at the switchport, the switch checks the source MAC address within the frame and stores it next to the port number on which it was received. This process builds the table known as CAM (Content Addressable Memory) or TCAM (Ternary Content Addressable Memory). And what about destination MAC addresses that are not known to the switch yet? In our picture device B MAC is not known to the switch yet. If a frame directed to this device B MAC arrives on the switch port, switch consults the TCAM table and if it does not find the MAC address- it multiplicates the frame sending it out to all the ports except the one it was received on. All the devices that the frame was not intended for drop the frame and only device B will interpret this frame correctly. After device B will send back the frame to device A, switch will learn the device B MAC and will store it in the table and will forward the frame directly to device A without having to multiply because it has the MAC and port already (1 A). Switches treat broadcast traffic specifically. Frames with destination MAC address of all “ones” or FF:FF:FF:FF:FF:FF in hexadecimal notation are sent unconditionally out on all ports except the one it was received on. On one hand the broadcast traffic is very important for Ethernet operations like Address Resolution Protocol (ARP), on the other hand broadcast could be the cause of serious network issues like broadcast storms or unwanted traffic handling or resource overutilization. That is why proper traffic segmentation in layer 2 is very important for network security as well as reliability. Having knowledge of how does switch work and how does router work, you should be able to clearly describe what is going on with an IP packet flowing across the network. IP packet sent across the network from computer A to computer B very likely has to pass several network segments. Some connected with Ethernet and some with WiFi. Every network segment will use different medium access method so different frame but packet stays the same.